As a freelance performer, accompanist and conductor Matt enjoys his varied recital and concert work. His first major CD solo recording is now available. In 2007 Matt teamed up with local trumpeter, Grant Golding, to offer a series of concerts entitled "The Trumpet Shall Sound". This successful duo are now in high demand for concert performances throughout the UK and have released two CD recordings. Matt suffers from M.E. and Fibromyalgia, and does as much music as health allows. NEWS: 14/2/18: Matt is awarded the Postgraduate Certificate in Humanities by The Open University. 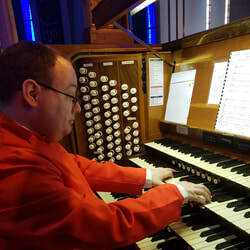 NEWS: 31/5/18: Matt is appointed Organist and Music Co-Ordinator at St. Michael's Parish Church in Linlithgow with their superb Vincent Willis pipe organ and growing adult choir and music programme. Con Spirito! was recorded this Autumn at the historic Hill pipe organ of Thomas Coats Memorial Church in Paisley, Scotland where Matt was Director of Music for over seven years. He left in 2015 to concentrate on his health, and now enjoys life as a freelance musician. Music includes works by Andriessen, Handel, Mendelssohn, Stanley and others, all played with Matt's trademark flare and enthusiasm on a fantastic instrument that he knows so well. Due to Matt's continuing health difficulties, it may be that engagements are covered by other performers or cancelled at short notice. Matt very much regrets any inconvenience this may cause, but hopes you understand that his health must be his first priority.